Have you ever experienced sitting absolutely still in the woods when a nice buck starts your way and suddenly he stops, sniffs the air, then stamps his feet and the next thing you see is the white flag bounding at hyper speed in the opposite direction? Alternatively, after miles of hiking and climbing, did you spy a trophy bull elk and after crawling through the briars and bushes for what seemed eternity, to see it simply disappear when you poked your head out of the scrub? What happened? If he didn't see you then the most likely cause was your scent. The game probably smelled you long before you sighted it and was on "alert mode." The stamping of the bucks feet was his last act of warning others of your presence, much like a beaver slapping its tail on the pond before diving out of sight. The erect stance and forward ear posture of the bull elk is the indicator your presence have been made by the animal. So, what can you do about it? 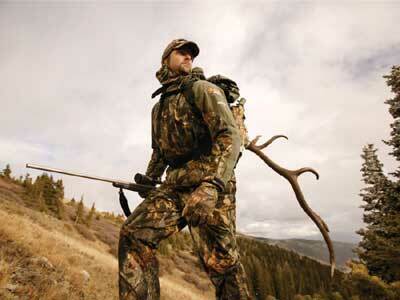 One of the very basic rules of hunting is to understand the crucial abilities of the game you are hunting. A complete understanding of the species abilities to DETECT you is one of the single most important aspects of hunting. Some game animals will hold an acute ability of sight. They don't miss a thing. From almost unbelievable distances, a bull elk will spot even the slightest movement and from far atop the mountain, the last thing you will see is his backside as he races to distant lands. Suppose he doesn't see you and you make a painstaking upwind stalk through the scrub and get within a few yards of the trophy and suddenly the wind shifts? Are you a "marked-man?" Is this the moment that your presence will be revealed? Maybe not, if you follow some of these tips to improve your big game hunting techniques. Over recent years, a number of grass-roots companies have sprung up around the country that advertise scent-retention hunting clothing, sprays and scent-reducing laundry materials. Incorporating a number of high-technology methods in the manufacturing process, some of this may be snake oil for the unwary purchaser. In other cases, the end user without question will swear by the product and never hunt without it. Let's look into this world of the molecule, for this is where it all begins and ends. It is the birthplace of your potential unmasking to a possible once-in-a-lifetime trophy. Without doubt, if that wind shifts and swirls around and ends up in the nose of the bull, he isn't going to wait around to see you up close and personal. So how does a hunter prevent himself from being detected? Back up miles and days before you set out for the hunt. It all starts in the PREPARATION of your hunt. The items mentioned that could aid in your hunt to avoid in being detected can be utilized. It all starts when you wake up BEFORE you go on your hunt. Personal hygiene is the first step to avoid detection. Simply said, take a shower and clean yourself. Do not use any perfumed soaps or scented deodorant. Do not put on aftershave or any colognes. Game will smell this stuff from a long way off. Stinging bees, wasps and other insects are also attracted to these scents and could make for a very bad day as well, if you insist in making a fashion statement out in the woods. If you are in a remote camp and showering is impossible, take a sponge bath before you go out after your quarry. Sitting around a campfire is a wonderful way of spending time with your friends at night but about the worst thing a hunter can do is to contaminate himself with the fumes from smoke. You become almost a scented neon sign for anything out in the woods to smell. So, if you want to sit around the fire, do it in your other clothes. Of course, there are multitudinous times hunters didn't do a thing about their smell, went out, and bagged a trophy. However, what we are speaking about is consistently bagging quarry, not by being lucky. Many would argue they take game with long shots therefore; the game can't smell them from such a distance. If you are hunting bison, that might be true but if it is Alaskan brown bear, sheep, deer, elk they can scent you from a very long distance away. How far you ask? That depends entirely upon the conditions and animal but scientists revealed in their studies in the Arctic a polar bear can smell its prey from over TEN MILES! Can a deer scent you from a mile? I would be quite inclined to think so, maybe even more. I have been completely concealed in a hole, recently showered and wearing camo on the edge of an Alaskan black spruce forest and have had huge caribou bulls scent me as they walked the tundra hundreds of yards away! Cover scents are another product that is offered and could be considered overrated. "Masking" your scent is a misnomer, simply said, it cannot do that. A spray simply adds to your scent, it cannot remove it. Many manufacturers would like you to believe their cover sprays, strips and other devices will elimate your scent and provide you with great opportunities for a successful hunt. Maybe not. 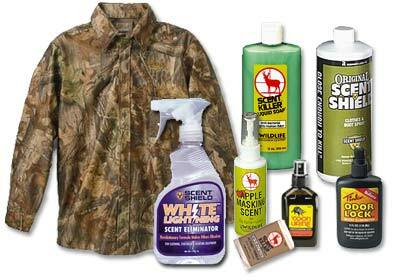 Spraying apple scent on your hunting clothes will indeed make you smell like an apple but nevertheless, your scent still lingers and is quite detectable. If you think it isn't, ask the police when they easily find drugs wrapped in oils, gas, perfumes, skunk scent, wrapped in fish etc. Remember what I said earlier about animals being able to detect scent in part of millions? Makes sense to me. Human odor (no matter if you have bathed or not) is a very strong scent to animals. Just ask the police dog that. It is known that dogs can detect scent of one million parts to one! Polar bears can smell incredible distances, somewhere up to ten miles out on the ice of a pending meal! Scent molecules of your body dissipate in the air, fall upon the ground, and can actually rest on top of water. In fact, you are shedding highly recognizable scent particles as if you were a dispensing giant plume as you sit, walk, lie, or swim in the outdoors. Millions of dead skin cells are continually shed from your body so its no small wonder the buck stomps his hooves or the bull elk scrambles over the mountaintop. Depending upon environmental conditions, your scent can linger for days! A damp and breezy day in the woods is the worst condition for keeping your scent contained. Be wary about this since a dry day with no wind would be ideal to stalk quarry if the rustle of leaves and other debris didn't make sounds for them to hear. A few years ago, an engineer in Detroit who worked in the auto smog emission controls lab had an idea. Since it is well known that charcoal is a wonderful filtering agent, his thoughts wandered around possibly laminating it into clothing. As a deer hunter, he knew the deer would scent him from quite a distance and he thought of possible methods to guard against this. Through trial and error, he finally succeeded in containing human scent in hunting clothing. At first it was bulky, hot and uncomfortable, not exactly an experience one would desire when afield. Through persistence and years of scientific investigation, the product finally developed into exactly the opposite. Most of this clothing is now comfortable, lightweight, and damage-resistant, the clothing is now regarded as an asset to hunting. There is still argument over just how effective it is but it appears this mindset has caught on and now the manufacturing companies enjoy a brisk business. How does it work? Scent molecules that enter the laminated material must pass through the thin "barrier" of charcoal and as they pass, the scent is almost totally reduced to non-perception. Of course, one cannot reasonably contain the entire body so a small amount of scent will still be released, through exhaled breath, an ungloved hand or perhaps a small bit of facial skin exposed. Most manufacturers incorporate drawstrings so one can secure loose fitting wrist, ankle or neck areas. The usage of a facemask as well as a hat made of the same material will greatly enhance your chances of not being detected. The number one rule when you step out into the woods to hunt is to take note of the direction of the wind and hunt against it. In other words, always hunt upwind if at all possible. Big game animals depend greatly upon their acute nose; it warns them not only of a food source, mating call or against danger. A mule deer will react as quickly from the smell of a human as it will from a stalking mountain lion. The softness of the camo/charcoal suits acts as a sound suppression system as well, therefore allowing a stalk into heavy brush with almost no sound whatsoever. Remember, it is very important to cover your face as well with the masks, since skin from a human is somewhat reflective and can be detected by game. Most manufacturers provide a scentless bag in which you can transport the clothing to the field to keep it from becoming contaminated. Make sure you wash your hands before handling the clothing if possible with non-perfumed soap. So, is this a cure-all for everything? Don't bet on it. Many things can affect a hunt. Primarily your knowledge of the game and its habits, weather, weapons used, geographical area and a host of other conditions will all play into part of the greater scope of the outcome. It is not wise to substitute the lack of knowledge and purchase items to attempt to compensate for your lack of understanding. When you see the head of your game is down feeding or turned away from you, that is the time to make your move. When the animal's head comes up from feeding or turns to your direction, stop and freeze. Most big game animals will not see you if you do this. 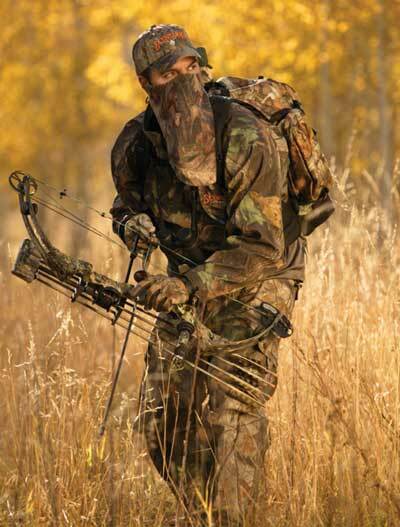 Scent and movement are the two primary reasons a hunter is recognized.